I love a great deli sliced pastrami sandwich so I figured that pastrami should be my next project. 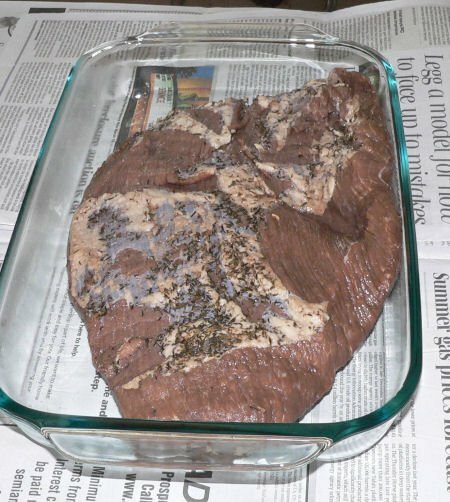 To use this recipe you need to plan about 3 weeks in advance because there is a 3 week curing process for the beef brisket. 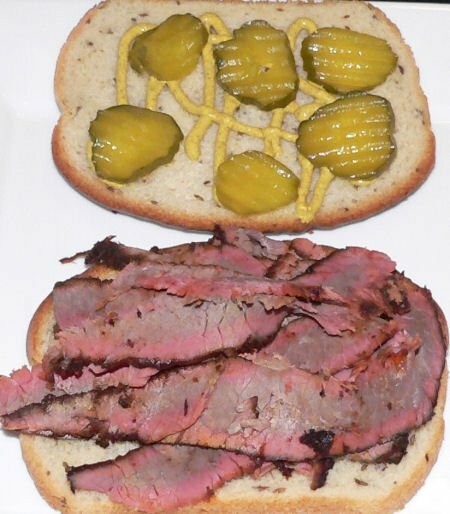 This is a really nice homemade pastrami recipe. In addition to the spices listed below, you’ll need a 5-8 lb beef brisket. After the three week cure, the brisket is briefly rinsed with water and then a dry rub is applied. The brisket is then smoked and sliced and ready for a sandwich. 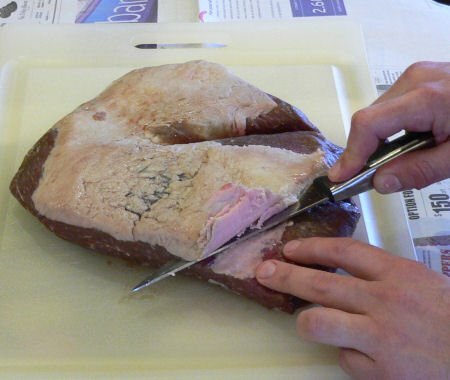 To begin preparing the brisket for the cure, I trimmed a bit of the fat off the beef brisket. 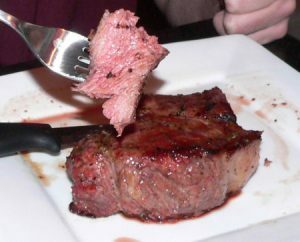 The purpose of doing this is so the salt solution can penetrate fully into the meat. The fat may act as a barrier to the curing so trim the fat to about 1/8 of an inch. To make the cure solution I mixed all of the dry ingredients except for the salt and brown sugar into a small bowl. In the meantime I brought the 16 cups of water to a boil and added the salt and brown sugar. 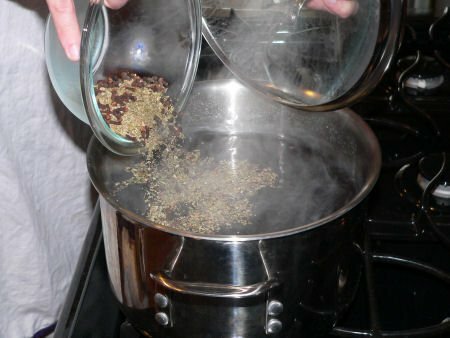 Once the water is boiling, the spices are added and the heat is turned off. Keep the lid on during the next step and steep the spices in the water for about 1 hour until the solution has cooled. After the solution has returned to room temperature it is now ready to be added to the beef brisket. I put my brisket into a 2.5 gallon ziptop bag. I then put this bag into another 2.5 gallon ziptop bag just to be sure it wouldn’t leak. 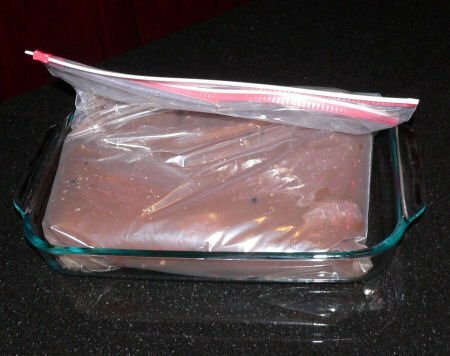 To provide a little bit more support, I put my ziptop bag containing the brisket into a casserole dish. Every 3 or 4 days the bag should be rotated and mixed up a bit to make sure that the meat is covered by the cure solution. After the three week cure, I rinsed off the brine solution the best that I could before adding the pastrami dry rub. 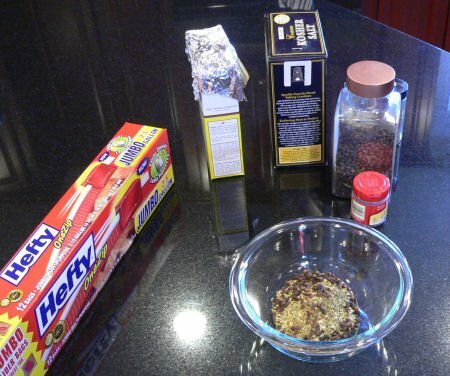 The pastrami dry rub is made up of the following and is enough for a 5-8 pound brisket. After the dry rub is applied to the brisket I let it sit in the fridge overnight. The next morning prepare your grill for indirect smoking as shown below. I used mesquite wood chips for this smoke. Try to keep the temperature around 250 or so. 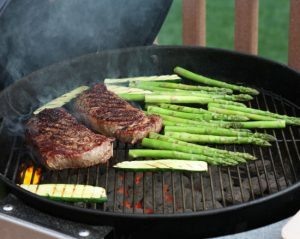 For standard barbecue it is crucial to keep your temperature below 250 but this is a little different. 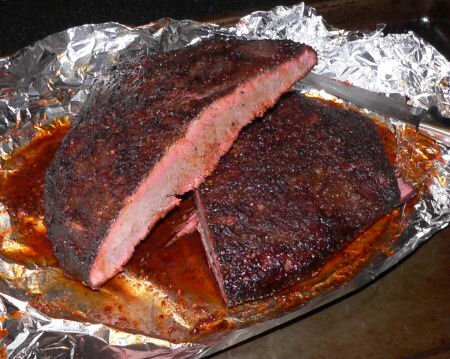 The three week cure totally changes the structure of the meat and this method of preparation will not result in a soft tender brisket like the standard texas brisket that will fall apart easily. So if your grill goes up to 300 or so that’s ok. You want to cook the cured brisket until it reaches 180 F as the internal temperature. After about 11 hours my brisket reached 180 F inside. 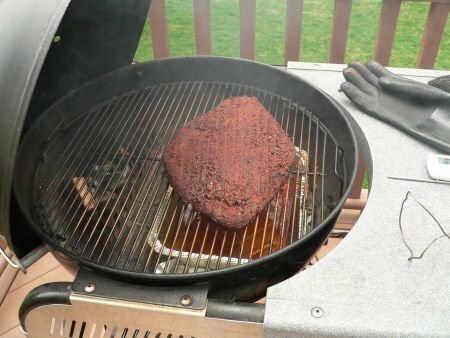 I read on the internet that you should smoke your cured brisket for about 4-5 hours at 250 F. I don’t see how this is possible. 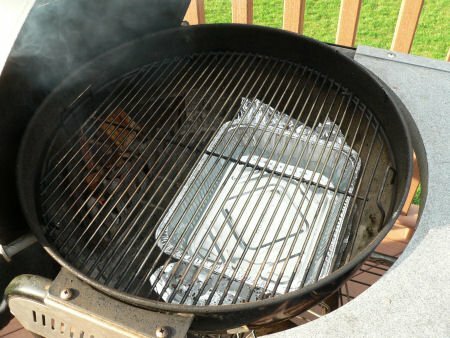 Perhaps you can shorten your smoke if you use a real smoker as opposed to a Weber charcoal grill. However long it should take – mine took 11 hours. After the smoke wrap your brisket in aluminum foil for an hour or so. I couldn’t wait so I only let it sit for about 30 min. Below is what it looked like after the 30 min rest. Notice the pink color. This is not a result of the spices. This is a smoke ring. 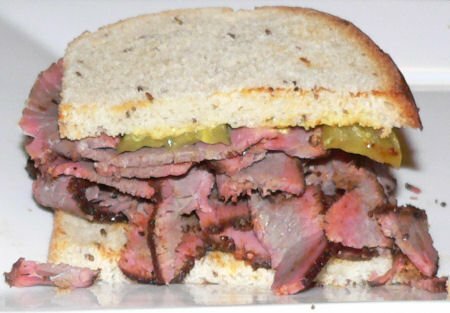 Standard pastrami is pink because of a chemical referred to as salt peter, or potassium nitrate, that is put in the cure. I wanted to avoid this step because I do not like artificial preservatives. My pastrami is not pink throughout so the only pink color is from the smoke ring. 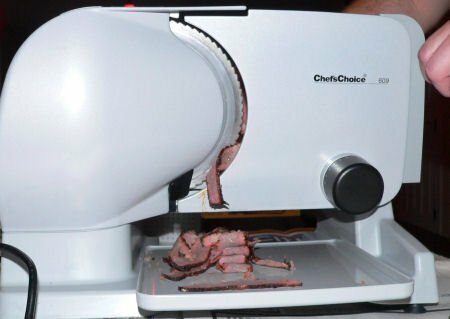 I used my meat slicer to slice the pastrami as thin as I could. 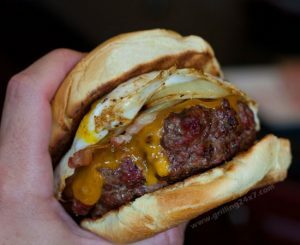 Pretty darn good homemade pastrami recipe!! !